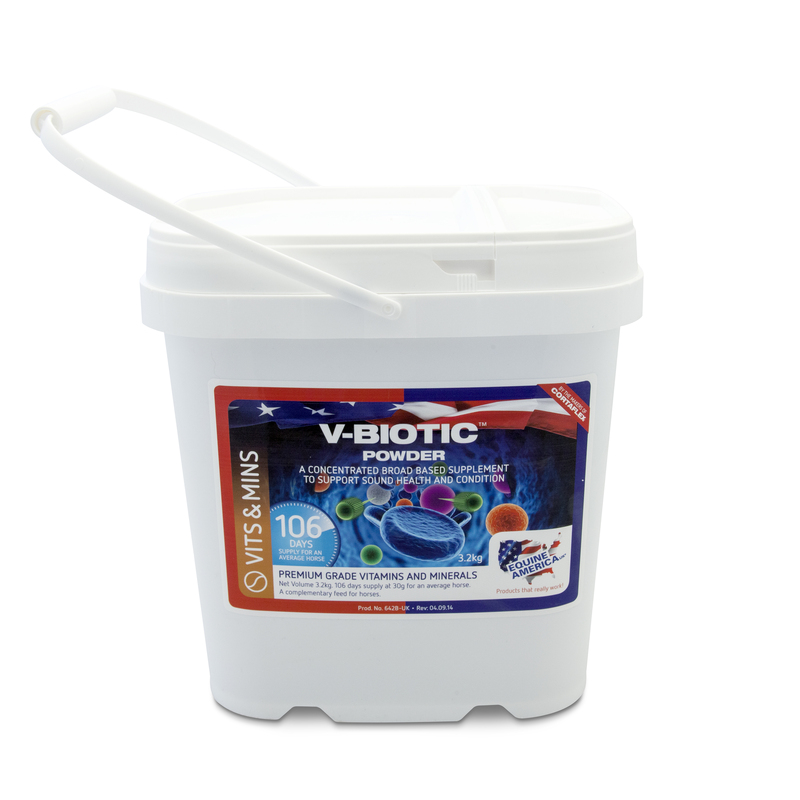 Equine America V Biotic is an all-round health promoting supplement, suitable for adding to your horse's daily feed. The unique formulation comprises a healthy blend of antioxidants and prebiotics, as well as beneficial Echinacea and Tumeric for aiding immune-system function. Such ingredients have been included to provide a complete balanced supplement, helping to achieve optimum equine health when fed regularly. Dicalcium Phosphate, Saccharomyces Cerevisiae, Distillers Dried Yeast, Magnesium Oxide, Echinacea Angustifolia,Curcuma Longa, Dehydrated Seaweed Meal, Sulphur, Sodium Selenite. Preservatives: Ammonium Propionate - E280 - 1,000mg/kg. Vitamins & pro-vitamins: Niacinamide - 9000mg/kg, Thiamine Hydrochloride - 2000mg/kg, Riboflavin - 2000mg/kg, Folic Acid - 2000mg/kg, Pyridoxine Hydrochloride - 2000mg/kg, Biotin - 20mg/kgCyanocobalamin - 4mg/kg, Cholecalciferol - 0.01mg/kg. Compounds of Trace Elements: Ferrous Sulphate Monohydrate- 50,000mg/kg, Manganous Sulphate Monohydrate - 28,100mg/kg, Zinc Oxide - 24,200mg/kg, Potassium Chloride -16,100mg/kg, Cupric Sulphate Pentahydrate - 15,900mg/kg Cobaltous Sulphate Monohydrate - 200mg/kgAmino Acids:L-Lysine, DL-Methionine. For a 500kg horse - 30g Per day. There are currently no questions for Equine America V Biotic - be the first to ask one!